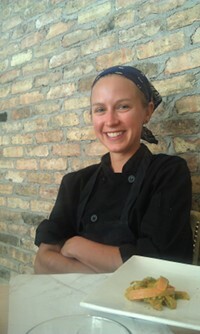 When I asked Chef Rachel Best her age, she gave me an impish sort of look that combined “I’ve been asked that before” with “should it really matter?” with “I understand this is an interview so I need to answer the question”. “I’m not as young as I look”, is what she actually responded. Chef Rachel Best of The Leaf Vegetarian Restaurant is 27. That fact tells you nothing about her ability to blend simple and complex flavors, dish after dish, into consistently outstanding sensations. Two disclosures here: First, I love The Leaf and have visited multiple times over the years since it has been open. Second, I was invited by owner Three Leaf Concepts to attend the Prix Fixe Raw Dinner Night, courtesy of the restaurant. The Raw Dinner was delicious but, in my mind, it really just reinforced what The Leaf is all about: consistently flavorful and satisfying vegetarian cuisine. Granted, a Raw Dinner had its interesting notes. Most unique, for me, was actually just getting over the idea that nothing would be hot and there would be no bread on the table! In a Raw Food diet, nothing is cooked over 115 degrees Fahrenheit. (The USDA recommends meat be cooked to 145-165 degrees, for comparison.) However, in this and most raw meals, none of the food was heated at all. And let’s ignore the supposed health benefits of eating Raw. Adherents will tell you that foods cooked above 115 degrees lose valuable enzymes and thus make the food less healthy. I’m here to tell you that if you eat a lot more fruits and vegetables than you would otherwise, eating Raw will be good for you regardless. Divine. Satisfying. No bread required. Chef Best has more experience than you might think. She became vegetarian at age 15, her mom thought it was a phase and stopped cooking meals for her, and she had to fend for herself. Mastery of the basics. After graduating from the University of Colorado, she spent two years learning the trade at the Dushanbe Teahouse. She then spent another two years with the Peace Corps in Africa, which provided exposure to a range of flavors and cooking techniques she would not have encountered at home. Returning to the US, she spent a year on a farm in Virginia before joining The Leaf. 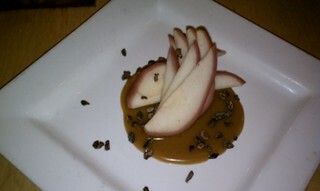 But it is, in some ways, as much art as experience that allows Chef Best to produce such amazing combinations of flavors. I asked her how she comes up with her ideas. “Sometimes I feel like I have writers block or weeks of nothing good and then it just clicks again”, she admits. “I exercise when I need to come up with dishes and menus. Working the body, moving and having a clear head helps with creativity.” In fact, she told us a story about a recent hike on Sugarloaf Mountain when she came up with her entire fall menu. Next Next post: WholeVine: Wine is Great, But There is So Much More!